Add a clothespin and a magnet to these wallpaper or scrapbook paper butterflies and you have lovely note holders or picture holders for Mom to put on the fridge. 1. Print and cut out the butterfly pattern. You can enlarge the pattern with a photocopier, if you wish, for larger butterflies. 2. Trace the pattern pieces onto wallpaper. You may use two different wallpaper designs, if you wish – may a solid design on the top and a pattern on the bottom, or vice versa…whatever looks good to you. 3. For the male, take the small body with the tail and lay it on top of the large body with tail, then set these pieces aside. 4. Take the small basic shape and lay it on top of the large basic shape. Using both hands, take the body with tails and scrunch together in the middle and do the same with the basic body, as shown in the inset diagram on the printed pattern. 5. Take a pipe cleaner or chenille stem and wrap it around and around the pencil like a spring. Remove the chenille stem from the pencil. 6. Fold the black chenille stem in half and run one end through the curled chenille stem. Place the scrunched together butterfly pieces between the straight stem and the curled stem, then fasten the two ends of the black chenille stem together with a tight twist. two black antennas by wrapping the ends once or twice around the pencil. 8. 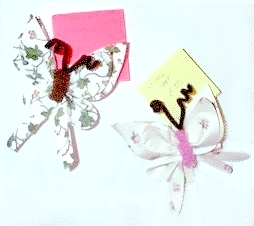 Glue the wallpaper butterfly onto a spring type clothespin, then glue a magnet to the clothes pin. I use these paper butterflies to hold my kid’s drawings on the fridge. If you prefer, you can leave off the clothespin and magnet, and stick the pretty butterflies on the wall or window with sticky tack.